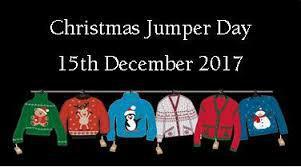 Don't forget, tomorrow, Friday 15th December, is National Christmas Jumper Day. Come wearing your best Christmassy jumpers and donate £1 to Save the Children. Parents and Carers, and other members of our community are also very welcome to join us at one of our Christingle Services on Friday 15th December. The morning one at 9.00 a.m. is for EYFS and KS1, and the afternoon at 2.45 p.m. for KS2, but you are welcome at either or both events.